For me, Whiteface Mountain is home to a veritable bucket load of bucket list items. Hike a High Peak? Check. Ski the biggest vertical drop in the East? Check. Get married on top of a mountain? Check. But even after all of that, Whiteface still holds a few of my unchecked bucket list items. 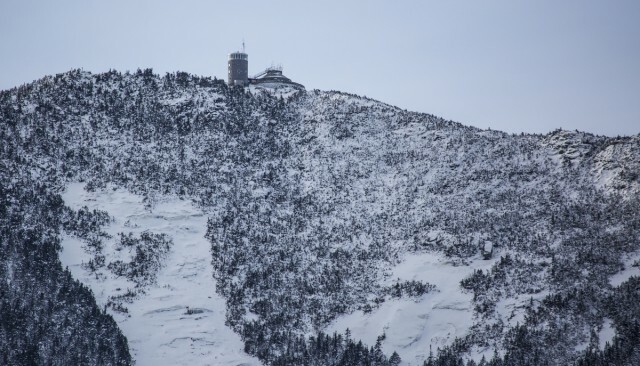 I still haven’t hiked to the top in the winter and I still haven’t skied down the Whiteface Veterans Memorial Highway. I expect both will happen eventually, but in the meantime I recently got to satisfy one item that’s been sitting in my science-lover’s bucket for some time — I finally found out what happens inside the mountain’s iconic castle, the incredible structure that seems to stand watch over the surrounding mountains and valleys like a great stone sentry. I wasn’t totally in the dark about the castle. I knew a weather research station was part of the tower, but that’s about it. How does one research the weather, anyway? I wasn’t surprised to learn the first step is to get close to it, something Atmospheric Sciences Research Center operations manager Rich Brandt excels at. Rich studied polar climate in Antarctica and in the North Pole for about 20 years. The weather in both locations is a bit more extreme than what’s on Whiteface. “It's comparable, but I think it's more extreme in the polar regions,” Rich said. "I think we've gotten up to 138 mile-an-hour winds up there (on Whiteface), which is pretty strong, but I don't think the temperature has gone much below minus 40. In Antarctica, it can get down to minus 70 degrees Farenheit." Rich hasn’t had to deal with anything that cold in Antarctica, but he has been there in the summer, when it’s below 50. Every inch of skin has to be covered, and anything that needs to happen outside is done with great haste. Within seconds, exposed extremities begin hurting from the cold and liquids flash freeze as soon as they're spilled. Whiteface’s summit is not without its extreme conditions, though. Wind speeds can exceed 80 miles an hour, and conditions can change rapidly there. That’s a good thing to keep in mind for hikers, and it’s also good for climatologists. 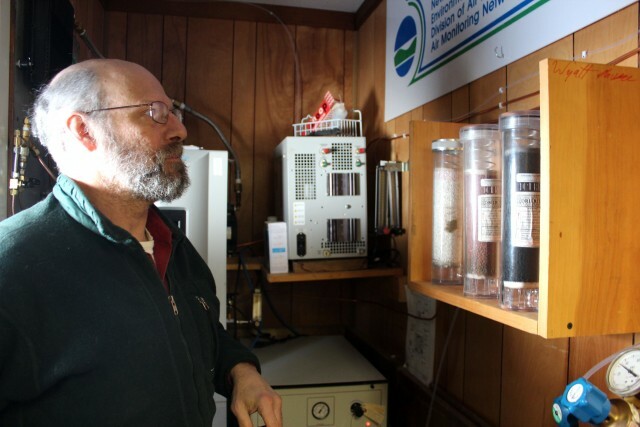 "A lot of it is just getting access in the winter, and working on the instrumentation," Rich said. "Those are the things I'm most interested in." 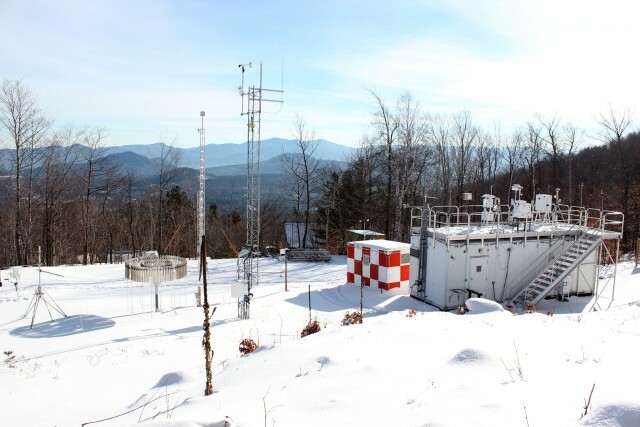 Rich gave me a tour of the weather research station that’s near the base of the mountain — if you’ve hiked the trail up Whiteface that follows the old T-bar cut up Marble Mountain, you might have noticed the Atmospheric Sciences Research Center. For a tour, just walk into the old ski lodge and ask for one. Just up the hill from the log-cabin style base lodge, there’s a white trailer. Next to that is a large, open area that looks like a UFO parking lot. There are shiny silver things that spin and rotate, buckets with lids that automatically open, and skinny towers with various panels, propellers, and plates attached to them. These devices collect data on things like wind speed, temperature, and precipitation, and the trailer is the mothership. Inside, Rich showed me three tubes, each with different colored granules inside. He explained that outside air is collected, and on the way the granules actually "scrub" different chemicals from it so it can then be used as a baseline to measure unscrubbed air against. The goal is to determine the amount of pollution in the air, particulates like black carbon, metals, sulfate, and nitrates, as well as trace gases like ozone and sulfur dioxide. The tubes are just the beginning. The collection of sci-fi looking instruments in the trailer measure chemicals in the air so they can be documented over time. These data are also collected on Whiteface's summit, making it possible to compare high and low elevation conditions. Besides pollution, the weather on Whiteface’s summit has been recorded since the late 1930s, shortly after the memorial highway was built. Now that long list of data can be used to see what's happened over time. Perhaps most interesting is how trends in the data correspond to environmental legislation. Rich showed me a graph depicting the presence of sulfur dioxide — that’s a particularly nasty chemical present in acid rain — in local precipitation. There’s a distinct upward trend that peaks then dips sharply in the 1970s, after the Clean Air Act was passed. “We've seen sulfur dioxide go down by something like 80 percent, and that's simply because of the Clean Air Act and subsequent ammendments,” Rich said. "It goes down in steps. This is an important story that needs to be told, especially to young people. The sciences leads the policy, and the policy solves the problem." The desire to better understand weather has been growing. 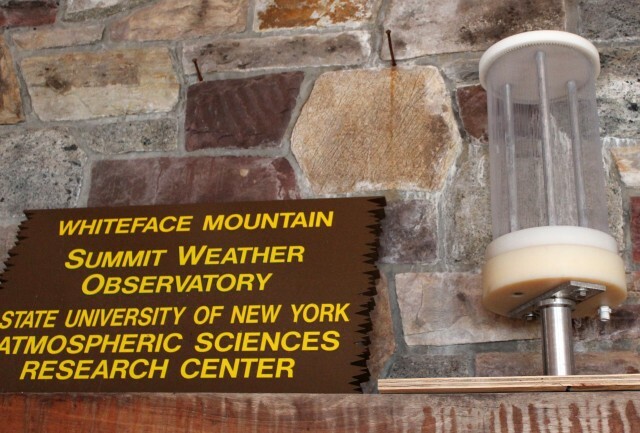 Some of the instruments at the base of the mountain are part of a larger data collection project that includes 126 similar sites that are being installed across New York. 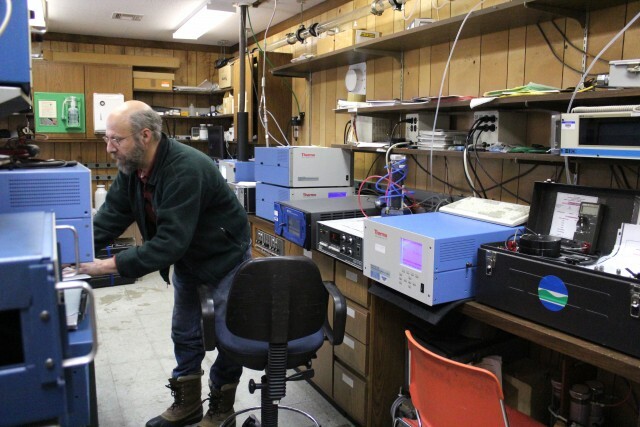 The Whiteface research station is pretty state of the art, and it’s staying that way. The summit is high enough — and far enough away from other mountains — that the clouds passing over it aren’t heavily affected by their surroundings. The elevation of the mountain also gives researchers the perfect opportunity to capture samples of clouds, which they hope to use to learn more about how cloud water chemistry works. ASRC operations manager Paul Casson explained that ASRC developed the cloud collection method in the 1970s. He said that's important because some pollution particulates act as cloud condensation nuclei, meaning they collect water droplets and become concentrated in clouds. "I've always liked the cloud water because it's really clearcut where it came from," Paul said. "We can look at back trajectories and see where that cloud came from; what area of the country or the world." Paul said pollution research is still important, but the conversation is beginning to shift more toward how clouds drive the climate. It turns out, Whiteface is well-suited to be part of that dialogue, too. "They used to collect this data using airplanes, and it was very expensive," Paul said. "Here, we're in one place all of the time, and we're letting the weather come to us." Even without all of the science, Whiteface is a big, bold, beautiful part of our region's landscape. The next time you’re gazing at this Adirondack High Peak, take a minute to consider the research that’s happening there. It might just be a drop in the bucket in terms of understanding the Earth, but its importance is immeasureable. If you're looking for more to do in the Whiteface Region, we have you covered. Spend a few days checking items off of your bucket list, get close to the mountain and its many downhill ski trails, and top it all off with dinner.